The history of Bedford Girls’ School has always been very important to me. I truly appreciate that BGS would not be where it is today without the foundations, the reputation and the past leadership of Bedford High School and Dame Alice Harpur School. Whilst BGS has its own identity, we have firmly built upon the foundations of our heritage schools and continue to do all that we can to recognise, value and appreciate our legacy. 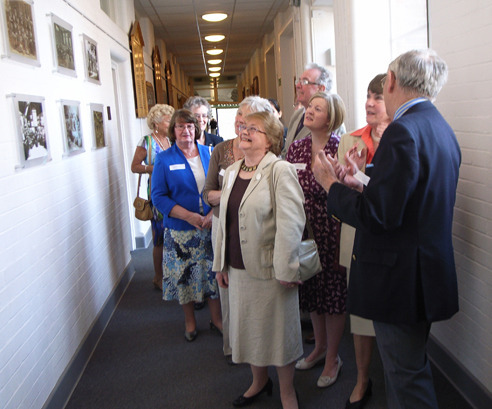 On Friday 3rd May, exactly a year after we celebrated the Official Opening of Bedford Girls’ School, we invited former headmistresses, governors and benefactors of Bedford High School to celebrate, with us, the vital role they played in strengthening our heritage. In particular, we wanted to offer an opportunity for our special guests to view the legacy items brought over from the High School which have been afforded a new home at BGS. For former pupils, parents and staff of Bedford High I recognise that leaving behind their beautiful buildings has not been easy. Whilst we cannot replicate the physicality of a building we can bring over tangible reminders of a place and try to recreate its spirit. I hope we have done that for both our legacy schools with our Heritage Corridor that houses photographs and paintings of former headmistresses, the boards that identify former head girls and our display case of memorabilia which we will change every year to ensure as many of our treasured legacy items are displayed. We have also installed the fabulous stained glass windows that had been kindly donated to the BHSg Junior School by the Abrahams’ family. New parents to the school marvel at the beautiful windows – another tangible reminder that our history enhances our future. Our visitors spent the afternoon in the gardens of Burnaby House, an enchantingly peaceful and reflective spot dedicated in memory of former BHSg pupils who sadly lost their lives while still of school age. It was a perfect afternoon, the sun shone and it was lovely that former members of the High School community could come together to share memories of the past but also feel confident about the school’s future. As Lottie Bruce, our Deputy Head Girl and former pupil of BHSg said to our guests: “All these physical things are a constant reminder and presence of Bedford High, but there is much more than that to remind us. Bedford High had an infectious feel of enthusiasm and community about it, and I can also feel that here. Therefore, it is not just the physical, material memorabilia that has been bought over which you can see, as well as these I hope you can feel a certain aspect of Bedford High in this school like I can”. Our new Alumnae association is keen to embrace the existing alumnae of DAHS and BHSg, not only to help them feel integrated into the new school but also to develop an active pool of women who can help support and engage with one another throughout the different stages of life. From school leavers seeking guidance on university, gap years, volunteering work or mentoring; to graduates wanting work experience, new networks or social links; support to members who are taking a career break or taking time to raise a family and our older members who would like to rekindle social links, enjoy clubs and activities or give back through volunteering. BGS Alumnae has huge and exciting potential; women of three schools supporting and collaborating with one another, a force to be reckoned with and an alumnae of which to feel enormously proud.